The Heavens Declare "Our Incredible Sun"
Explore our incredible sun from a Biblical worldview including its formation, function, and future. This episode explores the incredible sun God created on the 4th day of Creation. Our experts will explore how the sun formed, its purpose in Creation, what makes it unique from other stars, the science behind flares, sunspots, and fusion, as well as the future of the sun. The Heavens Declare episode 5 "Our Incredible Sun" with bonus features such as bloopers, extra interviews, and behind the scenes videos. 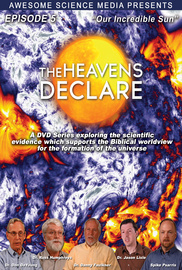 Includes 13 videos: from The Heavens Declare "Our Incredible Sun"